Ho! Ho! Hooray for Holiday Parades, the 2017 edition! Welcome to one of my favourite holiday traditions, the original and most comprehensive listing of all the Christmas, Holiday and Santa Claus parades for Ottawa, Eastern Ontario and West Quebec. It’s been a dozen (!!) years since our first holiday parade round up, and this post gets longer every year. Take a close look at the details – I noticed a lot of parades moving from a traditional week or day of the week, and lots of route changes for this year, too. There are more than 20 parades crammed into one three-week period! Saturday, November 18 starting at 11:00 am. New route this year! The parade starts at Ottawa City Hall and moves west on Laurier Avenue to Bank Street, then follows Bank Street south to TD Place. New toys (no used toys, please) and cash donations will be collected by the Ottawa Firefighters. Saturday, November 18 starting at 1:00 pm. This year’s edition of the Kemptville Kinsmen Santa Claus parade will begin at Holy Cross starting at 1:00pm. The parade route will follow Clothier St W and then Prescott St to the Kemptville College. The theme is “Christmas in the Movies.” Following the parade please join us for Santa’s North Pole at the North Grenville Public Library. Saturday November 18, starting at 5:00 pm. The parade will run from St. Lawrence Intermediate School, 1450 Second Street East. It will then proceed west. The theme for the 45TH Annual Parade is 150 YEARS OF CHRISTMAS. Join us afterward for Santa’s Street Hockey Challenge! Saturday, November 18, starting at 5:30 pm. (Note the change to Saturday instead of Sunday!) The parade runs down Strandherd Drive, starting at Beatrice Drive and ending at the park n ride, where it turns north for dispersal. Please remember to bring non perishable food items or cash donations for the Barrhaven Food Cupboard. Sunday November 19, 2017 at 1:30 pm (note the change to day of the week and time versus previous years!) The parade begins at Terry Fox and Castlefrank and proceeds Castlefrank to Abbeyhill Drive and on to Hazeldean Mall. Food and money will be collected by volunteer firefighters along the route for the Kanata Food Cupboard. Join Santa at the mall after the parade! Sunday November 19, 2017 at 1:00 pm. Parade starts at the Petawawa Plaza along Mohns to Herman, then Herman to Murphy Road, finishing at Civic Centre. Saturday, November 25, starting at 5:00 pm (new time!) The parade will start at North Augusta Road and Pearl Street then travel West on Pearl Street E. to Park Street, South on Park Street and lastly, West on King Street to Gilmore Street. The parade will feature many floats, bands, horses, clowns, community groups, dignitaries and finally the star attraction, Santa himself. Saturday, November 25 starting at 5:00 pm. Wear red and white, bring your food donation with you. This year’s parade theme is ‘Canada 150’. As Canada’s 150th Birthday year draws to a close, we will be inviting the public to participate in a parade all about Canada. Saturday, November 25, starting at 5:00 pm. The Downtown Gananoque BIA will host the 2017 Santa Claus Parade on Saturday, November 25th at 5pm! celebrate the holiday season in Canadian history. We’re encouraging participants to turn the parade into a walk through history, with each float focused on a different era over the last 150 years, whether it’s 1867, the ‘50s, the ‘80s, or anywhere in between. It’s a way to have fun while celebrating our heritage! Saturday, November 25, starting at 6:00 pm. Sunday, November 26, starting at 4:30 pm. Meet Santa after the parade at the Christmas Show at the Knights of Columbus hall from 6:30 until 8:00 pm. Friday, December 1. Come out on Main Street and greet jolly Saint-Nicholas a few days before he makes his round-the-world distribution of gifts! Christmas comes from the heart! Friday December 1, starting at 7 pm. Grab a seat along Osgoode Main Street and wait for the big guy’s arrival in the second annual Osgoode Parade of Lights. During the parade Santa’s helpers will collect “Letters to Santa” and drop them off at Canada Post on behalf of all the boys and girls in the village. Don’t forget to bring your canned goods for the “Fill a Truck Challenge“. Frosty the Snowman will be there ready as ever and Stay Puff Marshmallow Ghostbusters will also be joining in the parade. The Parade starts at Nixon Rd. and Osgoode Main and ends in the Foodland parking lot. As a continuation of the Canada 150 celebrations, OVCA has been fortunate enough to be granted funds so we will be able to put on a Special Fireworks display following the Parade of Lights at the Community Centre!! Saturday, December 2, starting at 11:00 am. The annual Merrickville Santa Claus Parade, hosted by the Merrickville Volunteer Fire Department Association, will make its way up St. Lawrence Street starting at 11:00am. Saturday, December 2. This year, Santa Claus will be stopping by Saturday, December 2, so join him to kick off the holiday season! Visit with Santa and some Hawkesbury’s associations while enjoying the parade that will start on James Street, will continue along Main Street and will finish at Hamilton Street. Saturday, December 2, starting at 1:00 pm. Don’t miss Santa’s favourite event with the Pakenham Santa Claus Parade! Pack a thermos of hot chocolate and head to downtown Pakenham for an old-fashioned, festive parade. Saturday, December 2, starting at 1:00 pm. Don’t miss the annual CBBCA Constance & Buckhams Bay Santa Clause Parade; floats gather on Baillie Ave for a 1:00PM start. Parade runs along Bayview to Len Purcell and winds up at the community centre for hots dogs, Santa, and hot chocolate. Be sure to check out the Christmas Craft Fair, Silent Auction, Outdoor Hockey Registration, and the Learn to Skate program. Be sure to bring your non-perishable food item for the West Carleton Food Bank. Saturday, December 2, starting at 5:00 pm. The annual SANTA CLAUS PARADE OF LIGHTS makes its way through Downtown Heritage Perth. Starting on Sunset Blvd. at 5pm, the parade of lights will travel south through town (Wilson to Gore), turning onto Cockburn Street and ending at Queen Elizabeth School. The parade always ends with a visit from Mr. and Mrs. Claus on the last float! Saturday, December 2, starting at 5:00 pm (note new start time and new downtown route!) The Renfrew Business Improvement Area (BIA) will be organizing the parade. The theme of the parade is ‘Christmas 150 Wishes’. 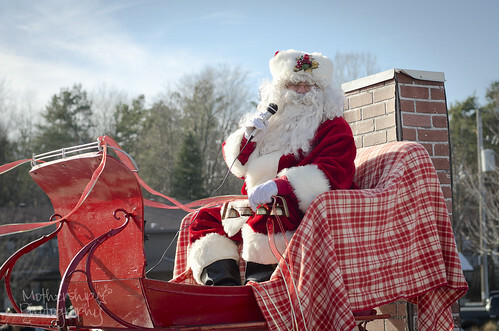 Santa will be at Town Hall in the gazebo at Low Square to visit with kids after the parade. Saturday, December 2 starting at 6:00 pm. Once again the Ottawa Professional Firefighters Association will be hosting Santa’s Parade of Lights on St-Joseph Blvd. in Orleans. Toy and cash donations will be collected by firefighters along the route. Saturday, December 2 starting at 6:00 pm. The annual Parade of Lights is a community favourite, drawing thousands of spectators along the parade route. Each year, dozens of beautifully decorated community floats set the tone for Santa’s much anticipated arrival at the end of the parade. The parade runs along Stittsville Main from Carp Rd. to Carleton Cathcart. Merry makers are also encouraged to stay for the lighting of Village Square Park, and to share in some hot chocolate and cookies. Saturday, December 2, starting at 6:00 pm. A tradition that goes back several years, this light-filled parade that departs from the Aylmer marina and attracts crowds from the entire region. Sunday, December 3 starting at 5:30pm Route: Visit our web site for all the details casselmanfestival.ca Hot chocolate will be served by Scotia Bank in front of the big tent. Saturday, December 9, starting at 12:00 pm. The Huntley Community Association is thrilled to announce we will be holding the 9th Annual Christmas Parade on December 9th, 2017 in Carp. The route starts at The Diefenbunker – 3911 Carp Road and follows Carp Road to Juanita Street to Langstaff Drive turning right on Donald B. Munro Drive to Carp Road finishing at the Diefenbunker. Missing this year: At the time of publication in early November, I wasn’t able to find information about Arnprior, Russell, Richmond, Smiths Falls, Embrun, Almonte, Eganville or Metcalfe this year. If you have any information about these communities or others not mentioned above, please let me know and I’ll update the post throughout the season. November 17, 2017 through January 6, 2018. Magic of Lights is composed of festive and vibrant LED lighted displays celebrating the joy of the holidays. A “drive through” experience from the comfort of your own car, the Wesley Clover Parks Campground route will be overflowing with spectacular light displays and animations where holiday themes will come to life in sparkling lights. Magic of Lights is truly a holiday family tradition and will be for years to come. Select proceeds from each carload admission will once again benefit the Ottawa Senator’s Foundation, last year’s event raised over $47,000 for this charity! Fridays, Saturdays, and Sundays from November 24, 2017 to December 17, 2017, 3 pm to 8 pm at the Cumberland Heritage Village Museum. Step into a holiday tale of your own as you explore seasonal scenes and activities inspired by classic Christmas stories and songs of years past. Take in the 30,000 lights illuminating the Museum, visit with Santa and send a telegram to the North Pole. Let your holiday spirit shine with cookie decorating or a Christmas craft. Singalong to your favourite carol then experience a horse-drawn wagon ride. Feeling chilly? No worries. Warm up by the bonfire and purchase a cup of hot cocoa from the Canteen. There’s magic to share with your family, friends, and loved ones of all ages at the Vintage Village of Lights! The Canadian Pacific Holiday Train hits the rails again in November, visiting over 150 communities. Since the program’s inception back in 1999, more than $7.4 million and over 3 million pounds of food has been collected in Canada and the United States. At each event, the Holiday Train provides a box car stage, a line up of great musical talents and a corporate contribution to the local food bank. The community, in turn, is encouraged to donate food and funds, all of which stays in the community. Local stops include Finch, Merrickville, Smiths Falls and Perth on November 27 and then Trenton, Belleville and Brighton on November 28. Check the holiday train schedule for more details. Thursday, November 30 at 6 p.m.Invite your family, friends and colleagues to count down to the lighting of the Museum’s giant outdoor tree, while enjoying Christmas carols, Beaver Bites and hot chocolate (while quantities last)! This event takes place at the same time as the opening of the Museum’s Christmas Market, which will be in the Grand Hall until 8 p.m. Note that the activities will take place outside, so please dress accordingly. Bundle up for an evening stroll through this picture-perfect postcard setting! With close to one million lights adorning the heritage buildings, trees and fences of Upper Canada Village creating a one-of-a-kind magical backdrop for its annual Alight at Night Festival…a true winter wonderland! Times and dates vary, starting December 1, so check the link for details. Saturday December 2 and Sunday December 3. The Village is transformed into a Village of Yesteryear. There will be a Victorian Tea and Penny Sale, horse-drawn wagon rides, pictures with Santa, face painting, strolling carollers and more. The 33rd edition of Christmas Lights Across Canada will kick off with an official illumination ceremony on December 7, 2017 at 7 p.m. Every night from December 7 to January 7, enjoy the magical winter lightscapes multimedia show projected on Parliament Hill buildings. A brand new experience also awaits you in Confederation Park with displays of lights that will “glow” your mind! People of all ages will get into to the holiday spirit as hundreds of thousands of dazzling lights shine in Canada’s Capital Region and across the country. If I’ve missed anything, or if you’d like to share information about your family-friendly Ottawa Christmas or Holiday event, please feel free to leave a comment or e-mail me at danicanada (at) gmail (dot) com and I’d be happy to add them to this (now epic!) post. Updated to include Arnprior and Petawawa!